An innovative bar tool will make your next Happy Hour even happier. 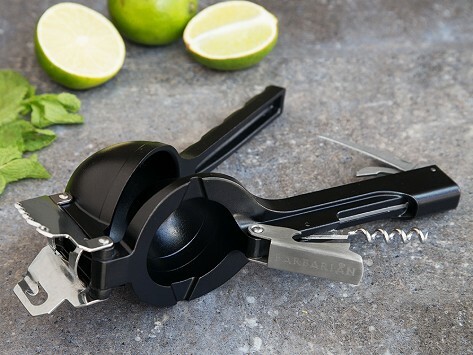 This heavy-duty multi-tasker combines the essential cocktail making tools with the body of a citrus juicer. Zest, cut, measure and more with less bulk and hassle. The design is sturdy but streamlined, and is perfectly sized to store at home or take along on camping or boating trips. Dimensions: 9.5" x 3" x 2.5"
Bought it for a Christmas gift so I have not even seen it yet. The box looks beautiful! Don’t have a jigger or a zester, but craving a cosmo? The innovative bar tools from Barbarian are built to streamline bartending duty and make it easier to enjoy your favorite cocktails. The heavy-duty multi-tools can juice fruit, pop tabs, pull corks and much more. And the compact designs are perfect to take along on camping trips, tailgating, or anywhere you want to mix up some cocktails—even if that’s just in your own kitchen. The larger 9-in-1 tool is a citrus juicer with eight other functions—like slicing, zesting, and measuring—built into the body. It can even help out with food prep (think marinades and dressings). 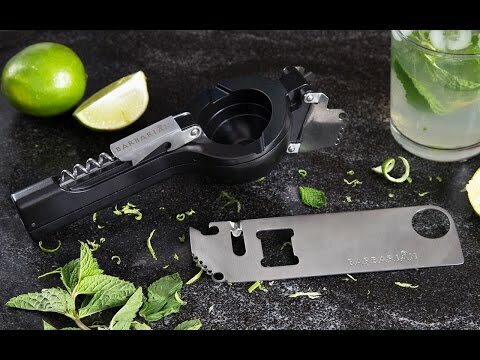 The stainless steel 5-in-1 tool is based on a bartender’s blade. It’s pared down to do the more essential tasks, like opening bottles and cans, and is small enough to fit in your pocket. Creator JC Davis loves entertaining. He wanted multi-taskers to make mixing drinks up easier, so he decided to make them himself. With his tools you can enjoy cocktails—and yourself—wherever you are.